The Curly Wirly Twirly Girlies: The bits and bobs for NSD to go with the 14 languages, 12 styles, 1 meaning words ! The bits and bobs for NSD to go with the 14 languages, 12 styles, 1 meaning words ! The bits and bobs as promised. 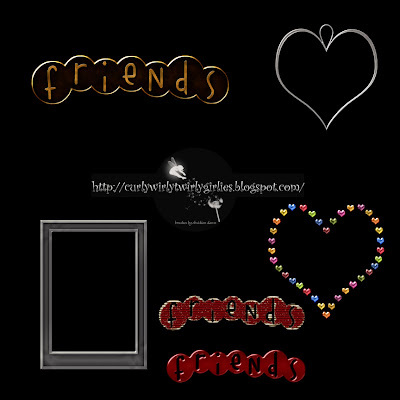 A bling heart overlay to show the love you have for your friends. The pewter frames as plain versions for you to decorate as you see fit. Some experimental words I was doing LOL. I loved the look of the the word – using two peas font goofball, but it couldn’t cope with anything other than basic English alphabet. To try and cut out the others was more than I could do so they were abandoned. The brass one is the latest action from atomic cupcake and I have been having a little play with it whilst I was uploading today. We are having a pyjama day in our house, the kids have the autumn snuffles, hubby is off diving for the weekend, and I don’t feel like doing much LOL. Anyway the results of today will be shared later this week so drop back if you want. These freebies have been shared on the understanding that they are not to be re-distributed in any means (including QPs). You may not share the files through any means, anyone interested in downloading them is to be directed to this blog. These freebies have been made using the actions available for purchase or downloading from Atomic Cupcake and brushes from Obsidian Dawn. Comments and feedback are encouraged and appreciated and you can download them here. Please remember your manners. Anyway the washing is calling me (uuuggghhhh). Blimey - you have been busy!! What a great idea Erika - I love it! I'm mentioning your blog on mine later today - you should get a few visitors... ;o) Happy INTERNATIONAL scrapbooking day!! Thanks for all the great stuff. Thank you so much for all of these languages! Nice job! Any chance you could do Norwegian? It would be "venner". And your French is correct. When you have the plural, you can use the male plural, amis. All the different languages are so wonderful, thank you for sharing them all.